rec. 2014, St. John The Evangelist Church, Upper Norwood, London, U.K. 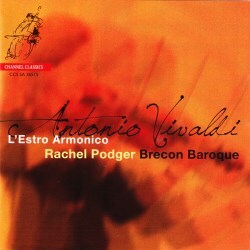 When Rachel Podger released her 2003 award-winning Vivaldi album La Stravaganza, with Arte Dei Suonatori I expected her to next record Vivaldi’s L’Estro Armonico. Some 12 years later she has now recorded that work also on Channel Classics. This time she can be heard with Brecon Baroque, another period instrument ensemble. The results have certainly been worth the wait. Prior to the publication of L’Estro Armonico in 1711, Vivaldi’s only printed works had been two sets of sonatas published in Venice: 12 Trio Sonatas for 2 violins & basso continuo, Op.1 (1705) and 12 Sonatas for violin & basso continuo, Op. 2 (1709) both products of his occupation as violin teacher at the Ospedale della Pietà, in Venice. Few collections of concertante works were as favourably received in the 18th-century as L’Estro Armonico, generally translated as “harmonic inspiration” or “harmonic fire” or as translated by Rachel Podger “musical rapture”. The name suggests a blend of brilliance and drama that surely prompted publisher Estienne Roger of Amsterdam to issue this set from a then relatively unknown composer. Interestingly L’Estro Armonico bears a dedication on the front cover to Ferdinand III, the Grand Duke of Tuscany. There is less uniformity of design in L’Estro Armonico than in Vivaldi’s later published scores. The set is divided into four groups of three Concertos, each of which consists of one for four soloists (Nos 1; 4; 7; 10), one for two violins (Nos. 2; 5; 8; 11) and one for a single violin soloist (Nos 3; 6; 9; 12). Notable is the additional role in Concertos Nos 1; 2; 7; 10 and 11 for a solo cello. Most of them are cast in the traditional three movement fast-slow-fast pattern. In L’Estro Armonico Vivaldi achieved a remarkably high level of consistency and artistic quality with the spirited Allegros contrasted with the soothing mood of the slow Adagio/Larghetto movements. There is much more variety of expression and melodic appeal than one might initially imagine and I would like to single out four concertos that are especially well performed here. The Concerto No. 1 for four violins, cello, strings and continuo, RV 549 contains a remarkable central Largo e spiccato — so-called after the bowing technique which here conveys a curious mysterious quality rather than the calming sound one might imagine. Remarkable in the Concerto No. 5 for two violins, strings and continuo, RV 519 is the ticking effect in the Largo which has a rather hypnotic quality. There is the melodically memorable opening Allegro in the Concerto No. 9 for violin, strings and continuo, RV 230 and the sheer exuberance of the final Allegro of the Concerto No. 11 for two violins, cello, strings and continuo, RV 565. Having whittled down my recordings of L’Estro Armonico down to three, my benchmark is from Europa Galante directed by violinist Fabio Biondi. This is an exhilarating period instrument performance that blows away the cobwebs and conveys a wonderful sense of colour and imagination. Recorded to demonstration standard in 1997/98 at Santa Maria Assunta, Puianello this valuable set was available on Virgin Veritas. I also greatly admire the account from Accademia Bizantina directed by Ottavio Dantone featuring violin soloist Stefano Montanari. On period instruments Dantone produced the recording in 2000 at Sala del Refettorio di S. Vitale, Ravenna, Italy on Arts Music. Long established in the catalogues but not forgotten is the pioneering 1980s period instrument account from the Academy of Ancient Music directed by Christopher Hogwood. This beautifully played and fastidiously prepared performance was recorded in London in 1980 and is available on an excellent digitally remastered Double Decca (c/w 6 Flute Concertos, Op. 10). Founded in 2007 by violinist and director Rachel Podger the ensemble Brecon Baroque is the resident ensemble at Podger’s annual Brecon Baroque Festival. For the music of composers such as Vivaldi, Telemann, Purcell and Handel, Brecon Baroque pare down in size to a small group which here numbers eleven players. Under Podger’s direction they are in stunning form providing beautifully judged accompaniments and employing speeds that feel judicious. Podger and each individual group of soloists convey an alert, fresh feel to the vivacious Allegros and this contrasts pleasingly with the engaging and often captivating playing of the slow movements. I have no hesitation in positioning this set alongside the finest accounts in the catalogue. Using my standard CD player this Channel Classics SACD has the benefit of excellent sonics being vividly clear and well balanced.